Prescribing and dispensing multiple pairs of glasses to the same patient has always been a good approach for high quality vision care and for practice profitability, but with discount vision plans as prevalent as they are, this concept is more important than ever. Selling second pairs of glasses is the best way I know to increase profit with vision plans. I started a policy in my practice that the second complete pair of glasses is 50% off about 20 years ago and we never stopped. I’ve written about this before and many ODs have adopted it, but many others think it gives away too much profit or have simply never tried it. If you are already selling lots of multiple pairs with a smaller discount, then by all means stick to what you are doing. But I was not selling enough multiple pairs and I decided to get more aggressive. It is better to make a smaller profit than no profit. The 50% discount is always off the least expensive pairs of glasses. This is pretty standard in retail. The first pair can be purchased through a vision plan and the discount is applied to all other pairs. All glasses must be complete pairs: frame and lenses. There is no limit on the number of glasses – all pairs after the first one get the discount. All pairs must be purchased and ordered at the same time. Some offices allow the patient to get the additional pair some weeks later and still get the discount, but I feel too many people procrastinate and never act. Quite often, when we tell the patient that all glasses must be ordered at the same time to get the discount, they just get out their credit card and do it. I also like the efficiency we gain when we measure, order, check-in, and dispense all pairs at once. Plus, our lab gives us 50% off the lens cost when we order them all at the same time. Raise your lens prices and frame mark-ups slightly before you start this. You still make a nice profit even with 50% off if your usual profit margins are strong. Put signs in your optical and on the frame displays that promote 50% off your second pair! Train your staff to always mention the second pair 50% off policy to every patient. Just bringing up the idea of a second pair will result in sales. Many times, staff members would not even mention the idea of a second pair, but this gives them a reason to bring it up. Train your staff to sell second pairs by simply asking the patient questions. Tell me how you use your eyes at work. What are your sports or hobbies? Do you participate in outdoor activities? Do you use a computer or tablet? 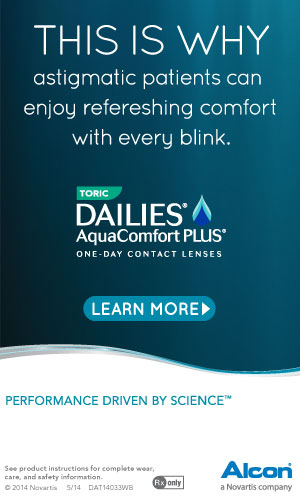 Do you watch TV in the evening (for multifocal users)? Every answer suggests an additional pair possibility. I find the kind of bonus that works the best is when there is a direct correlation between the task and the reward. When all staff share equally in a bonus pool and the goal is very general, like increasing gross revenue, everyone feels good about it, but I don’t think behavior really changes. When an employee earns $20 (just an example) every time he or she sells two pairs of glasses, they try harder. I offer spiffs like this for one quarter only, then I change the goal to something else. Some goals may be designed for opticians and some are for front desk staff. Some quarters, we have no bonus at all. We issue a check separate from their usual paycheck at the end of the quarter for the bonus earned. I track some goals through our office management software, but if that is not possible, I just have staff members track their own results on an index card with the date and name of patient. We spot check some of the results, but I find employees are quite honest about it. Staff members who see their bonus growing as they track their own data are inspired to work harder. It takes a little more time to sell multiple pairs and I often see opticians not bring up the second pair because they have other patients waiting. Don’t be too busy to make more money. Hire another optician so everyone has more time to sell.